The Tremaine Arkley Croquet Collection Prize, established in 2015, is awarded annually to the best research paper featuring the collection. We spoke with Mariah Dear, a fourth-year UBC student and the second winner of the prize. Mariah is majoring in Gender, Race, Sexuality and Social Justice and will graduate in May 2018. What made you want to write a series of poems instead of a traditional research paper? I’m minoring in English literature, and as much as I love to write academic essays, I much prefer writing of the creative kind! 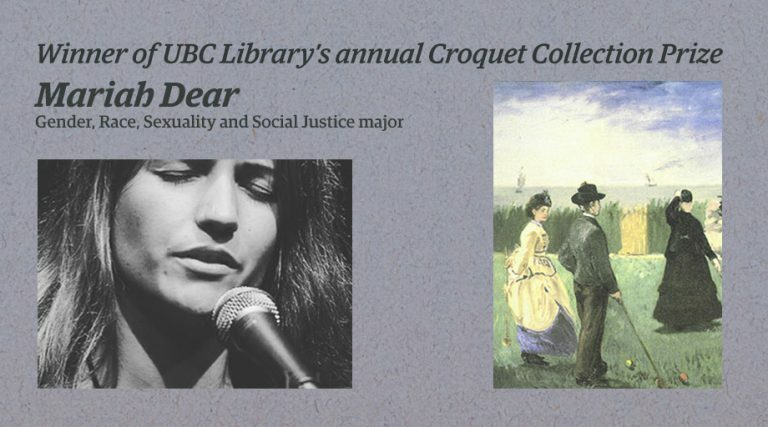 I love poetry – I considered doing Creative Writing in some facet for my undergraduate degree – and am the president of UBC Slam Poetry, the main poetry hub at UBC. I have been trying to work on and improve my poetry for ages, and this seemed like a fun and quirky new topic to write on, all while getting to apply for a prize. You wrote ten poems with ten accompanying images. How did you select the images that you wrote about? I selected the images by pure instinct. I didn’t look through the complete collection (there are hundreds of images) – but instead, I looked at probably around 100 or 150 of the images and selected the ones that grabbed me at first glance. 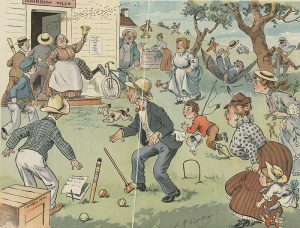 Most of those were unique for some funny or unique reason – I was intrigued by some of the humorous postcards. Do you have a favourite spot or branch in the Library? My favourite spots in the library are anywhere by windows. I love to be around books but I thrive on natural light. I find I can’t get anything done in the basement, but when I’m spread out on a table looking out onto campus, I get a lot done. The rural rush hour (1919) by L. M. Glackens, courtesy of UBC Library’s Open Collections. 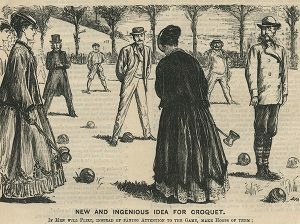 New and ingenious idea for croquet (1867), courtesy of UBC Library’s Open Collections. Mr. Stafford, darling, would you stand with your legs just there?